Below you can see how ours came together after watching the video. You can watch Bunnings' full catapult target game video tutorial here. I found that once my six year-old had watched the video, I didn't need to be too involved. She was quite capable of putting it together herself. While waiting for the glue to dry, design your target boards and put the scores on each one. You can paint them or use markers. Use any numbers that you like. For younger kids, three plates numbered 1-3 would work well. Glue your bottle-top on to the craft stick. When dry, it's ready! My kids decided that pom-poms would be perfect to use with our catapult. If you don't have any pom-poms, scrunched balls of paper work well. Set out your targets. You will have to experiment with positioning. This catapult can fling higher and further than imagined! Lovely to watch the concentration and cooperation. I enjoyed watching all the experimenting with catapult positioning and how far to pull back on the catapult to get the desired distance. They definitely got better with practice. As we made the catapult, my kids came up with lots of different ways that we could also make other catapults, or ways that we could get a better performance or quicker result. They were a little frustrated waiting for the glue to dry, which led us to talking about how we could make a similar catapult without any glue! These thought processes are so important for children to experience but in order for this to happen, they need to actually make and do things themselves, not just watch them being done. My daughter thought the idea of making your own skipping rope would be brilliant! Probably because she could make it the perfect length for her, unlike the bought one that we had to put knots at the handles in because of being too long. We thought that the way they make the handles was really cool! We've not done a lot of woodwork, so this would be great for developing some new skills. See the How to Make a Skipping Rope tutorial video here. Great for travelling or a few peaceful minutes while dinner's cooking is a cute portable tic-tac-toe game. No need to buy one though when the kids could make their own version. We love the use of rocks for the pieces! Check out how to make a Tic-Tac-Toe Game tutorial video here. Kids tired of those boring old shoes? Jazz them up with some cool DIY designs. This is a fabulous creative activity with limitless possibilities! See the How to Make Shoe Accessories tutorial video here. Who needs to buy toys when you can make them yourself? A fun process and a great game to play over and over. See the Make a Wood Block Game tutorial video here. We certainly don't have a shortage of art materials here, so pencil cases are often in demand. Here's a video tutorial to Make a Pencil Case. Looks like fun! My kids are always attracted to pin-wheels when we're out and about but they're actually really easy to make! These would look great out in the backyard. See the Make a Pin Wheel video tutorial here. We loved this Make a Felt Dart Board tutorial. It looks much easier to make than I would have thought and I know that my kids would have hours of fun aiming for the different numbers and colours. A great indoor project and activity. I definitely love DIYs that I know we'll get some real use from. I can see us really enjoying both making and playing with this ring toss game. See how to make a Ring Toss Game video here. Whilst we love making useful items, sometimes just creating something beautiful and decorative can be really rewarding. They can often make lovely gifts as well. We love the potential that this simple wall decoration DIY has. Easy to make but with so many different ways to customise to suit you or your child's creative flair! See the Wall Decoration DIY video here. One of the fabulous things about attempting DIY projects like these is that over the process of making, you learn and are able to change things to suit yourself. Through experimenting, you often come up with new ideas or plans for how you could adapt the projects to get the result that you are after. So much to learn and explore! 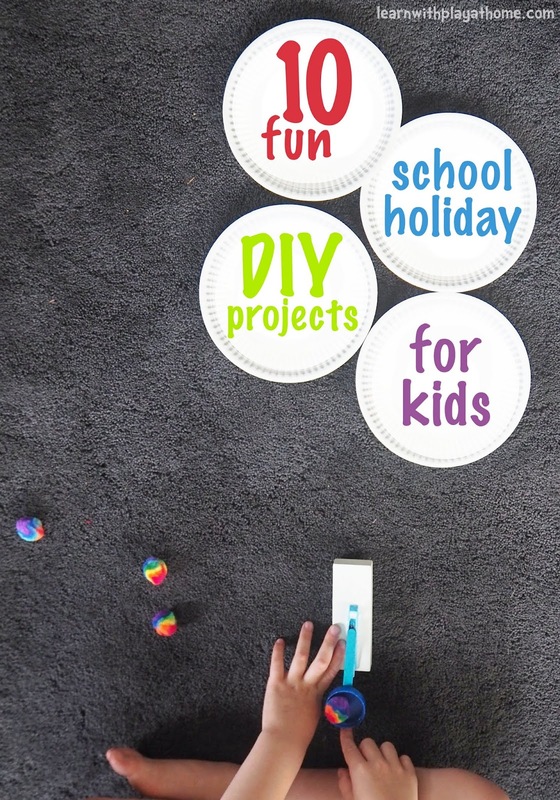 You can see all the rest of Bunnings' kids DIY project videos here. They have a really large range! We found that watching the videos really showed the kids how easily most of these could be put together and inspired them to want to have a go. Bunnings also run plenty of events and kids DIY workshops in store, especially over the school holidays, so check out the website for details.